The Lightroom photo workflow apps for iPhone and iPad are now completely free to use, ditching a former requirement to sign up for a Creative Cloud subscription or own the desktop software. "We're seeing alot of people come in first on Lightroom mobile, so now we're allowing people to use it locally on their local assets, their local photos and videos on their phone and tablet for as long as they like," Adobe's director of product management for digital imaging, Tom Hogarty, explained to The Next Web. The iPhone and iPad apps have always been free to download, but previously could only be used for a short time without a license or subscription. 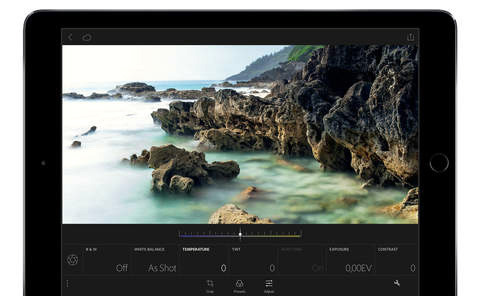 On launch, the titles would automatically start a 30-day trial of the Creative Cloud Photography Plan. Adobe has also updated the apps with several other improvements, such as a built-in camera, a Dehaze tool, and a Targeted Adjustment tool for manipulating colors in specific areas of a photo. The apps additionally have hooks with Photoshop Fix and Premiere Clip, the latter of which still requires an Adobe ID. Both versions of Lightroom require iOS 8.1 or later.